The Mermaid's Tale: The greatest failure in science? World news and events have, for us, personalized some of the grief that humans are imposing on each other, as we have referred to in recent posts (here and here). This leads us to reflect about science, beyond the relative triviality of what most of us do each day compared to the tragedies being experienced each day, too. The period known as the Enlightenment, roughly starting in the early 1700's, led to great hopes. Thinkers gave up on a priori received knowledge in favor of empiricism. The power of experiment and dealing with data rather than ideals led to and was stimulated by the development of new technologies such as optics, and these in turn led to quick, even startling, new understanding of the physical world. The world could be understood by 'science' rather than (in modern terms) 'philosophy', and could be manipulated. Enlightenment science led to physical and economic improvement, empire, wealth, and much psychological satisfaction. We in today's research world are a part of this 300-year-old legacy. 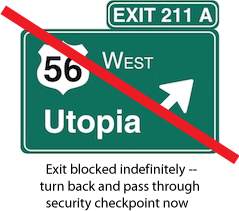 The same excitement led to various Utopian movements in Europe, which spread to the US and elsewhere. The cruelties of the world--harsh, unfair societies, famines, disease, inequities of all sorts--led to the belief that if science could make the material world better, surely by the same approach knowledge should be able to make society better, too! In this spirit various social-political movements were initiated. They included socialism, unions, communism, and other utopian visions of how society should be. Much of these ideas were theoretical, couched in terms of natural law--just as physicists and chemists were doing in their fields. The theory was that society, like organisms, was evolving, moving toward a time when oppression and inequity would cease. Human knowledge would lead this evolution inevitably to stable, equitable endpoints. So what has happened to all that? We live longer and in the wealthy countries easier lives (Novocaine alone validates the Englightenment approach!). But with so many people in wealthy countries needing a variety of personal therapists, with growing social discord and inequity even in these societies, and with global turmoil and horrors unabated, social sciences have manifestly failed to achieve the utopian goals, even approximately. Now, some in social sciences would disagree, saying that Darwin showed that we're all selfish and that the rapine and murder are built in, necessary, and even in that sense 'good'. They might argue that the social darwinian idea of society as a manifestation of evolutionary drives and our nature as their result, explains what we see (even, by a stretch, the idea of suicide bombers) very well. Equitable societies can at most be temporary aberrations of the underlying truths about life. The failure of social sciences to have applicability to improved societal life, or to understand society and behavior on their own terms, have led social scientists to turn with envy (and avarice?) to genetics even in political science, and to all sorts of high-tech approaches by social and behavioral sciences including our own anthropology (here, we're not referring to neurosciences). This turn, not accompanied by mea culpas, shows that we don't really understand society on terms that enable us to do anything about it, the way understanding physics and chemistry has led to so much success. Unless it's to have Big Brother dope everyone up with gene 'therapy' so they vote the right way, don't mind being abused, don't become addicted, or whatever else we think we find genes 'for' that affect behavior. Why this is can be debated. But the social sciences (like the natural sciences) have become a self-protecting institutional part of universities. Until we start pulling the research plug on these fields until they deliver the kind of societal good we demand of the material sciences, in our view we'll just keep on wastefully spinning wheels. And people, even children, in so many places around the world will keep on quipping about death. Yes, science is very powerful and has done much good. But the greatest failure in the sciences, is in those that might be most important. But isn't there a key difference between the physical sciences and social sciences? Notably, the findings of physical science are incorporated into the culture (antibiotics, vaccinations, Vit D in milk, etc., etc.) leading to improved lives and healthier populations (at least where it's affordable). On the other hand, the social sciences have taught us a lot about human behavior - that is optional behavior. We know a lot about how to riase healthy, balanced, less neurotic children - but we neither teach it nor require it. Therapy would help many people - but only in the most extreme cases does the State insist you get it. Just a thought from a Psych undergrad. Gary, you make a valid point about the findings that are incorporated into culture, though the evidence for the effect isn't necessarily always strong or lasting -- peri and postmenopausal hormone therapy being a case in point. Should we all be taking vitamin C and D? And, you are probably right that therapy would help many people, but I am not sure it is always for the reasons that people expect. For all the complexities of cause and effect, the difficulties of determining cause and effect, and so on that we often talk about on MT, it's difficult to sort of who improves because of therapy, who in spite of, and who without, or who would have anyway without. Plus, many people do not improve. And indeed, why are there so many different kinds of therapy? I suspect this reflects how much is NOT known about human behavior and how to modify it, not how much IS known. This could well be as good as it gets! Again, our point was not that we know nothing about behavior. But we're skeptical about how much we actually know and how much societal improvement has happened--as opposed to technical improvement--and how much of that is due to science. Is everyone having or needing drugs and a therapist to get through life an improvement in society? Anyway, the main point was that society as a whole--the level of harmony, equity, and the like has not seemed to increase, especially globally, as a result of the last 300 years of science including social sciences that claimed to be doing just that (e.g., Marxism). If society is still screwed up as a rule, that is a failure of the Utopian idea that knowledge will do the trick.